…And not just any Weed grinder but the best weed grinder the market can offer. We have taken the liberty of creating a list and giving insight on some of the top weed grinders available in the market. We have provided some proven insights with regards to some safe, durable and non-toxic weed grinders. Word of caution: do not be fooled by some of the cheap grinders available at local gas stations and some head shops. They can end up causing you to incur extra costs rather than have you save some cash. That said, you should consider buying the weed grinder online. This way you will end up saving some considerable amount of cash. In this piece we shall go into every detail there is to know about weed grinders from what they are to qualities of the best herb grinders and what you should avoid in weed grinders. Last but not least, we shall provide detailed reviews of some of the best herb grinders available in the market today. 1 What is a Herb Grinder? A weed grinder is also referred to as cannabis/weed/marijuana grinder. Essentially, it is just a small device with teeth that are used to grind herb tobacco and other small plants. Depending on the design, herb grinders come with 1, 2 or three compartments. Additionally, they are made from different materials which include acrylic, metal and wood. Before the herb grinder was designed and introduced in the market, many people used scissors and some even their fingers to grind the herb into small chunks as they pleased. Needless to say, this was a tedious process which was also inefficient. What was even worse is that it left the smell of weed or the herb you were grinding on your hands. Currently, courtesy of improvement in technology and the availability of CNC machining, herb grinders were made and major improvements have been made as well. For any herb fan, the herb grinder is one stylish, functional and important tool they cannot afford to not have. Now, over the years, the demand for herb grinders has increased. As a result, the supply of herb grinders has also skyrocketed. Why this is a great thing for the most part, it does make choosing the best herb grinder a difficult process. Note that the process is made difficult but not impossible. To choose the best herb grinder, there are some factors that you will need to pay attention to. These factors will help you to evaluate the quality of the herb grinder in question. Some of these factors include the shape as well as the number of the grinding teeth, the no. of pieces the herb grinder features, the material the grinder has been made from, the lid magnets and several other distinguishing features. In this piece, we go ahead and describe some of these features in details to give you a general idea of what these are. Outlined below is how the compartments are designed to work. These are also referred to as 2-piece grinders. They only feature a single compartment in which the herb is placed, ground as well as retrieve. Because of this (everything happening in one compartment), most time the herb ground is usually inconsistent in size. In addition to this, retrieving the herb amidst the teeth can prove to be a rather difficult process. This is also known as a 3-piece grinder. These herb grinders feature a single compartment like the 1-compartment herb grinder. But in addition to this, it features several tiny holes at the bottom of the compartment. These holes provide entry into the 2nd compartment. These holes are designed to only let through a certain size of ground herb. As such, when you are done grinding, you end up with fine and evenly ground weed. Also, given that, all the fine herb when the grinding is done are in the 2nd compartment, retrieving the herb proves to be far much easier. There aren’t any teeth getting in your way. By now you surely get the drift with regards to the naming. These are also referred to as 4-piece grinders. These types of herb grinders feature an additional compartment. This 3rd compartment is separated from the 2nd by a fine screen. The 3rd compartment is designed for pollen or if you are grinding herb, it is designed for kief. These are by far the most efficient and the type we recommend for our readers. As a matter of fact, the herb grinders that we review are all 4-piece herb grinders. Now, aside from the efficiency and consistency, is there any other difference between these herb grinders? Yes. The herb grinders also vary with regards to price. The 3-compartment grinders are by far the most expensive of the three types – and for good reasons as well. 4-piece grinders are made with more material and also sport additional features including a pollen chamber ad a filtering screen. We recommend our readers to choose the 4-piece herb grinders because with these types of herb grinders they have the ability to produce kief. Another factor that affects the quality of a herb grinder is the material it is made of. This may sound petty but here is a quick overview indulging you on just how the material affects the quality and efficiency of the herb grinder. Acrylic grinders are by far the cheapest type of herb grinders on the market. These grinders only cost a few bucks. They are perfect for individuals who are trying out the art of herb grinding and those who for some reason cannot find another grinder to purchase. It would not be fair if we did not point out that acrylic grinders do not last as long. They look good to the eye but after using them several times, they start to break down. The acrylic teeth tips start chipping and breaking off. At times, if you are not careful, you may end up with these bits in your herb. Another point to note is that these acrylic grinders are mostly 2-piece grinders. As such, they do not provide you with the benefit of making kiefs. We strongly advise our readers from getting these acrylic grinders. Smoking, ingesting or vaporizing herbs with bits of acrylics is needless to say, dangerous. Wood is a material that looks great on herb grinders. Like any wooden product, herb grinders need to be carved. As such wood grinders only come in 1-compartment types. You, therefore, cannot get kief using these wooden herb grinders. However, while the wooden grinders have their own shortcomings, they are loved by many because of their look and feel. They sport a more natural look and appeal. The type of wood used to carve the grinder affects the price of the wood grinders. When you purchase a wooden herb grinder, you should make sure that the herb grinder does not have any finishing on the inside. The herb grinder should not have any paint finishing or any other finishing at that. Why is this important? Well, you do not want to run the risk of ingesting any other material aside from the herb. Things can take a turn for the worst in the blink of an eye when you do. Raw wood for the inside of the herb grinder is best. As for the teeth, on the wood grinders, while they do get the job done, they are not as effective as metallic grinders (more on this next). If you insist on getting yourself a wooden herb grinder, you should ensure you get the very best there is. At the top of the list of wooden weed grinders are the Magic Flight Finishing Grinder which should be used with the Magic Flight Vaporizer. If you have got your chemistry right, you understand that there are many different metals available. However, not all of these are perfect for making herb grinders. Some are poisonous and others while they are safe for use and are not cost-efficient. The metal preferred for making herb grinders is aluminium. There are some companies that claim to have their metallic herb grinders being made from titanium. You should not be fooled by this marketing rose. Most likely, they are only coated with titanium. How can we be sure of this? Well, it does not take a rocket scientist to do the math and deduce that titanium herb grinders would not make economic sense. Think about it, businesses are always trying to lower their production costs right? Titanium costs $6 per pound when raw while aluminum costs $0.75 per pound when raw. With these figures, it goes without saying that no herb grinder is made from titanium. Agreed this can be pretty confusing especially when some companies are marketing their products as being made from titanium. If it makes any difference, you are not alone in the confusion. But we do hope this clears up the confusion for you. Now, is aluminum safe? Yes, it is. There have been some rumors going around speaking of the dangers of using aluminum weed grinders. But many of these are baseless and are not founded in any facts. But what about the flaking? How do I deal with these? Simple, just brush them off the grinder surface and you will be good to go. That said, metal grinders are probably the best type of herb grinders. As a matter of fact, many of the herb grinders we have tested and recommend are metallic. Now that we have all the basics covered, let us get into the meat of the article – the reviews of the top herb grinders on the market. When we were testing and preparing to compile this intricate and comprehensive review, there are several factors that we put into consideration and that acted as the basis of our rating. One of the factors that we considered for a product to quality into this list was its material. The herb grinders that we have are all constructed from aluminum – anodized aluminum to be specific. The anodized aluminum has great color and does not need to be painted. This is a great feature since it means that the herb grinders will not chip or peel with time. Adding to this, we also considered the number of teeth each of the herb grinders has in relation to its size. As pointed out earlier in this article, the higher the number of teeth the better and more efficient the herb grinder is. It is able to provide finer herb that burns with more evenness. The golden rule of thumb is having 50 teeth in every 2.5-inch diameter. Lastly, but still important is the number of compartments the grinder features. Many of the full-sized grinders in the market come with 4 pieces. Inclusive in the pieces is a magnetized lid (this also contains the teeth), a second compartment with holes, a third compartment for catching the ground herb and a 4th that collects the kief produced. Sure there are some good pieces that have lesser pieces. But in this article, our aim was to provide you with the best and as such only focus on 4 piece herb grinders. Most often than not, when buyers are comparing two products and working to decide which they check out, they consider the price. While this is an important factor to consider, most people do it wrong. Rather than comparing the two prices, one should consider the price and quality of one product vs the price and quality of the second product. This will shine light onto whether you are getting value for your money or not. The Black Tie 2.5 Inch Grinder is by far one of the best Weed grinders on the market. Black Tie has been in the industry for quite some time now and has over time setting itself up as a leader in the industry. It has dedicated itself to providing quality herb grinders that consumers can trust and depend on. And the best thing about the company is that even with the high-end features, the Black Tie 2.5 Inch herb grinder comes with an affordable price tag. Like many of the metal grinders we have tried and tested in the past, the Black Tie herb grinder is made from anodized aluminum. As a result of this material, the herb grinder is very light and corrosion resistant. In addition to this, it is also very smooth giving it a high-end look and feel. It is also important to point out that the herb grinder features a pollen screen built into the herb grinder. Now, is the Black tie worth all the praise it has been getting or is it all just hype? To answer this, let us start with the number of teeth it features. The herb grind comes with about 50 grind teeth. These teeth are diamond shaped and provide great consistency. As we mentioned earlier, the diamond shaped teeth are the best type on the market. The herb grinders using this herb grinder is thus great for both vaporizers and joints. Complementing the quality and number of teeth is a smooth twisting action. Unlike most herb grinders, the Black Tie grinder twists smoothly and with minimal resistance. Using the herb grinder, you will tire less courtesy to reduced friction. Adding to this the second piece of the herb grinder comes with 30 holes providing access into the second compartment. These 30 holes are strategically placed on the surface of the compartment. The ground herb will not get jammed in the hole during the grinding process. The Black tie herb grinder comes with a mesh filter. And not just any filter but a steel mesh screen. This is designed to provide you with kief. Given that the filter is made from steel, you can rest assured that it will last for a long time and is rust resistant. In addition to this, while other herb grinders feature screens held in place with plastics, this herb grinder screen is held in place with a strong piece of metal. As such, the screen will remain in place for the longest possible time without popping out while you are busy grinding away. Another feature that consumers loved about this herb grinder is the badass kief catcher included in the compartment. The kief catcher features no tread marks on its bottom surface and the corners are rounded which makes scraping off the kief a walk in the park. There are no tight corners where the kief can hide. If you have ever lost pollen scrapper in the past, you know how frustrating it can be. If you haven’t experienced this, then you probably are extra careful or just lucky. Those tiny plastics just have a way of getting lost. It is like talent that they have honed over the years. But talent or not, skill or no skill, with the Black Tie grinder you get to safeguard yourself from the frustration that follows. The brand provides the unit with 2 pollen scrapers. With these two, we advise that you keep one in a safe place you can retrieve later in the event you lose your active pollen scraper. In addition to this, you also get a velvet carry pouch. The carry pouch comes with drawstrings which gives it a high end and classy look. This pouch is designed to be attractive as well as functional. It helps to protect the herb grinder from sustaining damage in the form of dents and scratches. The herb grinder will, therefore, remain in sparkling shape for a very long time. By now it should be obvious, the Black Tie I a pretty decent and awesome herb grinder. In addition to being awesome and cool, the grinder also comes with some great extras which add to its functionality. The Black Tie herb grinder comes at a reasonable price. Compared to other grinders on the market which are twice its price and almost half its quality, the Black Tie grinder is by far the best. Its users have given it 5-star reviews and have nothing but praise for it. We honestly did not come across cons with regards to the price and quality – no complaints there. What we did find ourselves wishing is that the company adds some variation to the herb grinder. As it is, the Black Tie Grinders only come in the 2.5-inch size. Different sizes could help in providing more variation and convenience. The Black Tie Grinder reviewed above is manly. Everything about it, especially it’s color and design screams man. 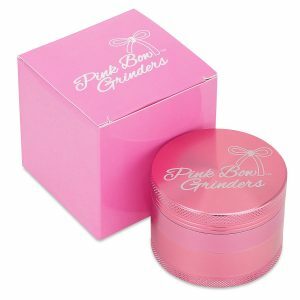 As such, and in a bid to cater to the female users, Black Tie presents a Pink Bow Grinder line of herb grinders. Ladies will absolutely fall in love with this particular weed grinder version. It is a complete replica of the Black Tie herb grinder in quality, features, and extras. The only difference is that it is finished with a pink color and has a bow-shaped logo. Buy the pink bow grinder here! There are very few brands in the weed grinder industry that can brag of having a popular and positive review. But Space Case is privileged to be one of such brands that evokes a positive response. They have been operational for a long time now and have in these years provides its customers with quality herb grinders. The Space Case herb grinders are made in the USA. This alone gives them an edge over other products in the market. That said, you should note that they have a high price tag. But despite their expensive price tag, the herb grinder still continues to sell and get overwhelming positive feedbacks. This is a testament to the quality and functionality of the weed grinder. For a while after gaining entrance into the herb grinder industry, Space Case has been a brand known for its style and simplicity. Most of their herb grinders come in the colors black and silver. In the recent past, however, Space Case decided to diversify and now provides herb grinders with a host of different colors. 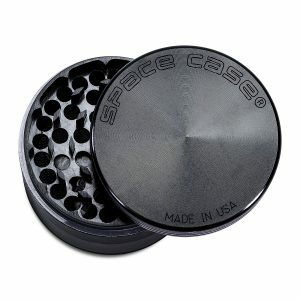 The Space Case grinder is made from anodized aluminum. The aluminum gives it a lightweight feel and a great look as well. It is perfect for both medical and recreational marijuana patients and smokers respectively. With regards to the number of teeth and teeth design, the Black tie grinders and the Space Case share a lot with only slight differences. We noticed that the Space Case herb grinder teeth are perfectly diamond shaped. However, the Black Tie herb grinder reviewed above comes with a hybrid shape being both diamond and trapezoid shaped. In addition to the unique teeth design, the Space Case also boasts of having many teeth. And as we earlier pointed out, having a large number of teeth is a plus as it ensures that the herb is grinded properly and is consistent as well. The Space Case herb grinders have a greater number of holes compared to the Black tie grinders. With the increased number of holes, the Space Case herb grinders allow more ground herb to pass through to the second compartment. But despite this, ultimately, it comes down to your preference. The Space Case grinders are designed with very strong magnets on the second piece as well as on the lid. These two attract each other and keep the contents of the herb grinder from spilling out. Without these neodymium magnets, the grinding process might turn into a huge mess. The Space Case grinders feature a similar filtering screen to that of the black-tie grinder. The filter is designed from steel and is reinforced with an O-shaped ring which holds it in place. Given its popularity, the herb grinder is bound to have some myths surrounding it. They may not enough discredit the brand per se but nonetheless, they are worth demystifying. First and foremost, the Space Case grinders are made of anodized aluminum and not titanium. Many make the mistake of confusing the material used to make the herb grinder since Space Case refers to the anodized finish of the herb grinder as a titanium finish. Secondly, many believe that space Case grinders come with lifetime warranties. As a matter of fact, the brand does not provide warranties with their products. While this may be disappointing for some customers and even a deal breaker for others, you have got nothing to worry about as Space Case provides high-quality weed grinders. Do not get it twisted. These myths were not laid out in the hope to deter you from making the purchase. On the contrary, we laid them out to have you make an informed choice. We stand by our review of having the Space Case as one of the best herb grinders in the market. This Space Case herb grinder, unfortunately, does not come with many extras. Instead of providing more extra features and items with the herb grinder, Space Case decided to focus all their efforts and creativity in providing a top quality product. But it is not all dark and gloom. The Space Case herb grinder comes with a guitar pick pollen scraper. The pollen scraper has the Space Case Logo on it. If you are into guitar playing, you will find this extra pretty handy. The Space Case herb grinder is of high quality, just like the Black Tie herb grinder. However, the Space Case grinder is more expensive compared to the lack tie herb grinder. Price is the number one reason why the Space Case grinder comes in second place in this list. When you are purchasing the Space Case grinder online, be sure to countercheck the ratings of the seller. Only buy from a reputable seller otherwise you run the risk of getting a Chinese knockoff. The Santa Cruz Shredder comes in third place. It is the smallest of the three herb grinders with a diameter measuring 2 1/8 inches. It is made in the USA which gives it more credibility. But the fact that the Santa crus shredder has made it to this list only means that it has something to offer its users. Some of its top features include the teeth design and its ergonomic grip. Like the herb grinders that we have reviewed, the Santa Cruz is also a perfect pick for medicinal and recreational purposes. The herb grinder is made from anodized aluminum. And like the other two herb grinders, it is light and strong. The herb grinder is mid-sized and comes with 4 pieces. It is important to note that the diameter is significantly smaller than the Black Tie and the Space Case which has 2.5-inches and 2.2 inches in diameter respectively. The Santa Cruz Shredder is different from the other two grinders when it comes to its teeth design. While the Black Tie and the Space Case herb grinders generally have a diamond shaped teeth, the Santa Cruz Shredder grinders feature rectangular teeth. The corners are indented to make the teeth even sharper. The general idea behind the teeth design is to have the 4 sharp sides. Compared to the two sharp points of the diamond design, four is definitely better. The only shortcoming is that the teeth design does not allow for a thorough grinding of the herb. In this, the Santa Cruz shredder is outperformed by the other two herb grinders. The magnets that the Santa Cruz Shredder features can be compared to those many anodised aluminium herb grinders feature. The herb grinder makes use of two magnets, small in size. One is in the lid of the herb grinder and the other is in the second piece of the grinder. The two magnetic pieces attract each other and help to keep the herb grinder locked at all times. This prevents the herb from spilling even when you get too vigorous. In our time spent reviewing herb grinders, we are yet to find any herb grinder that comes with a different magnetic design. 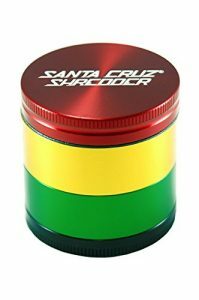 The Santa Cruz Shredder features a magnets similar to the Black Tie herb grinders and the Space Case grinders, which is actually a good thing and testifies to the quality of the grinder. The Santa Cruz Shredder is similar to the Space Case herb grinders in this. It does not feature lots of extras. With the Santa Cruz Shredder, you should not expect to get any special packaging of the carry pouch that you have seen featured in the Black Tie herb grinders. In addition to this, you do not expect to find an extra scraper in the packaging as well. But despite all these extras it misses, the unit is simple and is of high quality which speaks volumes. That said, we should point out that while the extras are a great addition, they are surely not important than the herb grinder quality. A factor that most people love about the Santa Cruz Shredder is that it comes with a wide variety of colors. The colors featured by the brand include black, blue, rasta, gray, green pink and just about any color, you find on the rainbow. The color variety adds fun to the herb grinder. The Santa Cruz herb grinder, like the Space case, features a guitar pick kief scraper. While they are great additions to the herb grinder packaging, especially for a guitar player, it is not as efficient as that which comes with the Black Tie herb grinders. We have provided three top products on the market. But which one do we recommend to our readers? Honestly, we recommend all but the Black Tie grinders stands out more like a sore thumb making it hard for anyone to miss it. We have dedicated some considerable amount of time to trying and testing numerous herb grinders. Before we landed on these particular herb grinders, we can attest to the fact that it did take quite some grinding and ranking. And with many of the products having many subtle differences, the ranking was not a walk in the park either. That said, we should point this out. While there are some brands that are more popular than others, given their fierce marketing (such as the Phoenician, Space Case and the Santa Cruz Shredder), the Black Tie grinders remain to the top product. These herb grinders offer quality and value and we are yet to find a herb grinder that rivals the quality and price value the brand offers. While we have gone out of our way to provide you with a comprehensive review, and are by far the best resource you have to weed grinders and anything related to weed growing and smoking, we do acknowledge that there are some other sites that can be of use. In addition to this, when it comes to purchasing the products, we recommend that you get them from Amazon as it is by far the most credible online shop there is today. With that said, hopefully, the information provided guides you in making the best choice of a quality weed grinder.